Watching the sun set over the Pacific Ocean while indulging in marvelous mariscos was one of the most magical moments that I enjoyed in Mazatlán. For our final dinner in town, we headed to Mariscos La Puntilla, a fifteen-year-old open-air eatery specializing in fruits of the sea prepared Mazatlán style. The atmosphere was kick back, with views of ferries coming in and out of nearby Isla de la Piedra. 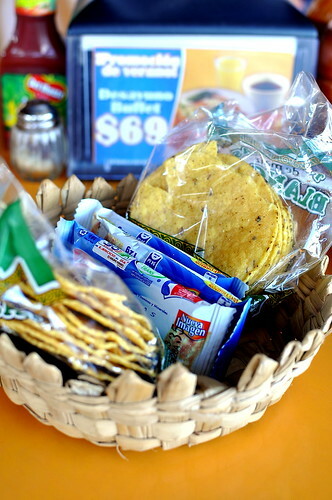 We were greeted by baskets full of saltine crackers and tostadas, as well as a selection of hot sauces, upon being seated. While I was initially excited to try all of the nifty condiments, the seafood here was so spectacular that not much of anything was required for complete satisfaction. While my traveling companions sipped Pacificos and margaritas, I was in the mood for coconut water. The plentiful bits of coconut meat floating about made up for the fact that the drink was served in a glass rather than in an actual coconut. To start, we shared an order of shrimp pâté, one of the restaurant’s specialties. The pâté was made from shrimp, queso crema (cream cheese), mayonnaise, and chipotle. 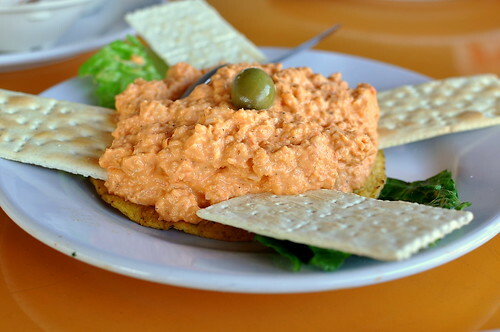 The heat from the chilies reeled in the pâté‘s richness, as did the salty crackers. It was a really solid and unique starter. For my main course, I shared two dishes with our awesome tour guide and fellow seafood lover Jesus Benitez. 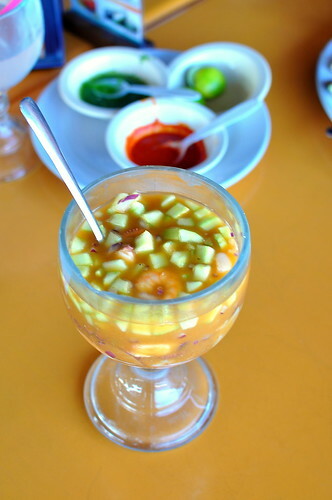 First up was a Mazatlán-style campechana, a mixture of snails, octopus, shrimp, and scallops served in a warm shrimp- and tomato-based broth. 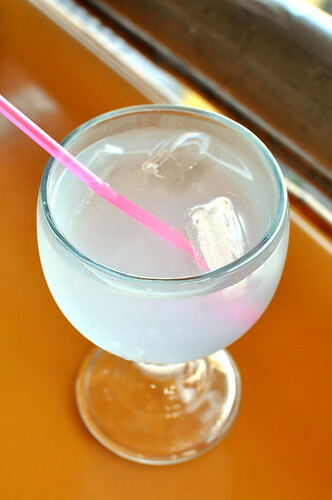 While I’ve sampled various Mexican cocktails in the past, this was my first time experiencing one served lukewarm. 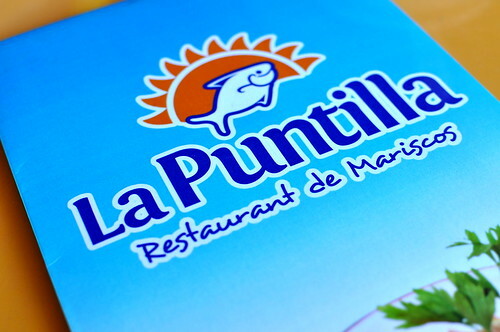 What really impressed me about La Puntilla’s campechana was its well-balanced flavors and perfectly “cooked” seafood. From the snails to the octopus to the shrimp and scallops, not a single element was too well done. 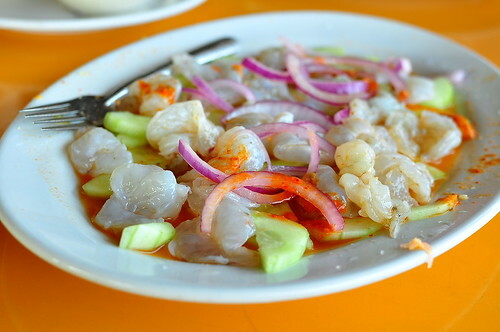 Even better than the campechana were the aguachiles, pristine local shrimp dressed in lime juice and chilies. This preparation was simple yet sensational, highlighting the shrimp’s freshness and snappiness to the fullest. 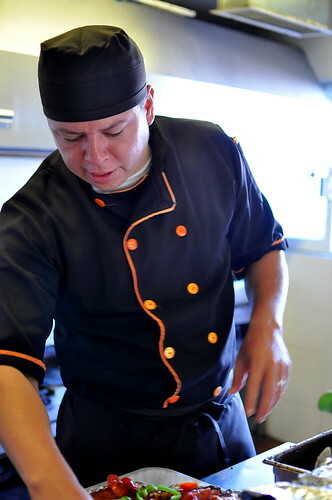 For the final portion of our meal, we were invited into the restaurant’s kitchen to watch Chef Arturo prepare the house-special pescado zarandeado. 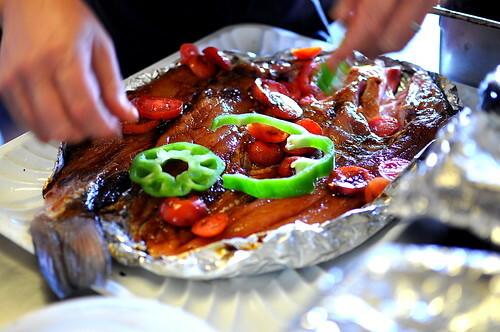 After slathering the butterflied red snapper in a mixture of soy sauce, garlic, lime, and oregano, he scattered slices of bell peppers and tomatoes on top. 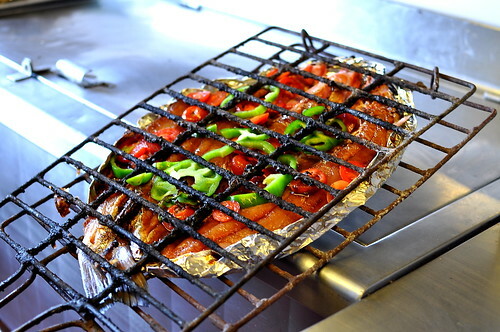 Next, the fish was grilled over charcoal for half an hour. Lightly sauteed onions added the finishing touch before the fish was delivered to our table. 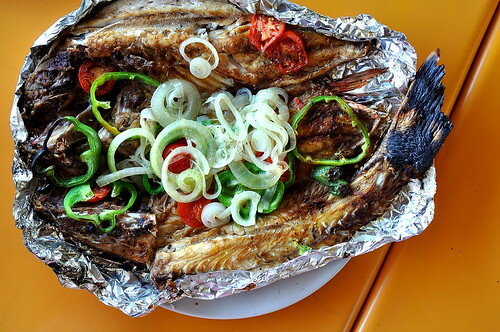 We flaked off tender hunks flesh fish to eat straight up or wrap in warm tortillas along with some salsa and vegetables. It was a spectacular conclusion to our seaside feast.